(Natural News) According to the U.S. Centers for Disease Control and Prevention (CDC), hundreds of thousands of Americans have parasitic infections in their bodies. Emergency rooms in the U.S. say they receive 1,000 cases of tapeworm annually, and that more than 60 million Americans suffer from the effects of having been infected with the “cat poop” parasite, with symptoms such as blindness, heart issues including heart failure, seizures, blood issues, and even death. A parasite is an organism that thrives by feeding off a host. Parasites can be microscopic while some are visible and can reach up to two feet long. They can stay unseen in a body part of a host and remain dormant, with the host not feeling anything until the parasite decides to actively wreak havoc. One of the most dangerous groups of parasites (or the ones that need the most attention in terms of treatment and those that require the most attention in terms of monitoring) are internal parasites. They are the ones that can be obtained by ingesting mishandled, contaminated, or spoiled food. Proper handling of food should always be a primary concern of everyone, as food-borne diseases, in worst case scenarios, can cause death. Other ways in which a person can pick up a parasite include poor hygiene habits, animal-to-human transmission, traveling to high-risk areas, poor sanitation of household objects and food, or by having sexual contact with a parasite-filled person. 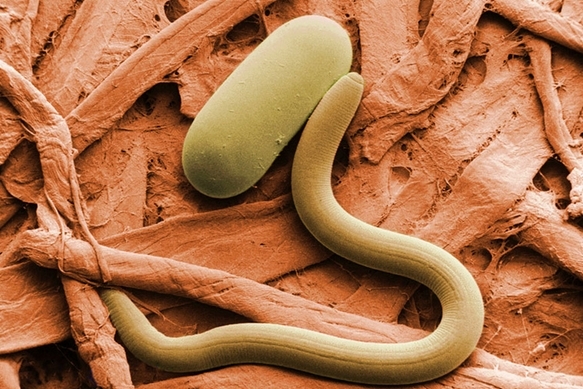 Sometimes, an infected person may not manifest the symptoms that having a parasite can bring – provided that the person in question is in good health. However, there are certain factors that can aggravate the situation; for instance: having a high-sugar and high-carbohydrate diet; having dental fillings with heavy metals; drinking from contaminated outdoor water sources; eating improperly heated meat; having a weak immune system; being under high amounts of stress; consuming high amounts of dairy; drinking too much caffeine; and eating raw meat. Mental fuzziness such as forgetfulness or feelings of confusion. Treating yeasts, parasites, and other fungi in the body requires three steps. First, these foreign entities should be eliminated, then they and the toxins they have produced should be flushed out of your system, and finally, your body must find proper support during the process of regeneration and replenishment. You don’t need to use expensive antibiotics to get rid of parasites. You just need to make the necessary dietary adjustments, such as removing all natural sources of sugar from your diet; taking cayenne supplements to allow your sweat to flush out parasites from your system; ingesting apple cider vinegar to improve your digestion; and taking vitamin C, coconut oil, garlic, and olive oil for overall health and wellness. For more stories on general health and wellness, visit Nutrients.news.